In this festive VeggieTales book, the Veggies are celebrating Christmas -- decorating the tree, singing carols, and exchanging gifts. But even though it's so much fun to give and receive presents, the Veggies all know that the greatest gift of all was God's gift of Jesus, his Son. Children will love the colorful art featuring their favorite Veggie friends. Parents can use this book to introduce little ones to the reason we rejoice at Christmastime -- Jesus' birth. I love VeggieTales! When my twins were little VeggieTales movies and songs played in our home regularly. They were one of a select few cartoons that I would let my daughters watch. My husband and I volunteered at a youth camp just before we had our twins and VeggieTales songs were played at every gathering before the service began. The teens loved the songs (and so did my husband and I...still do). 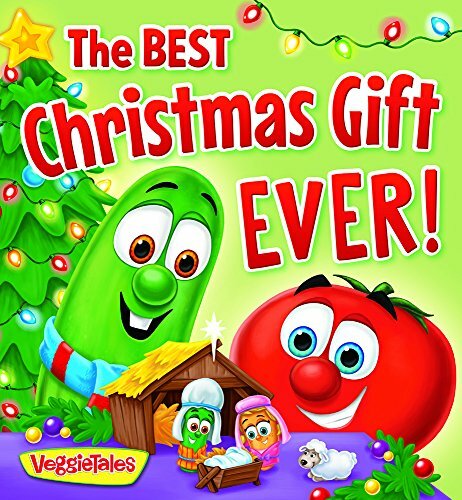 The Best Christmas Gift Ever is an adorable rhyming VeggieTales story sharing that Jesus is the best Christmas gift of all. Many of your child’s favorite Veggies are there in their bright, eye engaging, and fun colors. A great addition to your Christmas collection for your little one. As a reviewer for First Look Bloggers (Worthy Publishing), I received a review copy of this book in exchange for my honest and unbiased review. My thanks to Worthy Publishing and the author. Melinda Rumbaugh grew up in Southern Illinois, reading past her bedtime whenever she could get away with it. As an editor for WorthyKids/Ideals, she still spends a lot of time reading, though stealth and flashlights are rarely necessary. She lives in Brentwood, Tennessee, with her husband, Erik, and their two cats, Qwerty and Gizmo. Lisa Reed has been drawing pictures since she was old enough to hold a pencil. She began her career as a graphic artist for a screen print company and has been illustrating books for the past 15 years, including dozens of children's books. Lisa lives in Indiana.